Mickey Rourke appeared recently in Star magazine's Stars: Are They NORMAL or NOT feature. From what I gathered, it's NORMAL for Nicole Richie to order a few In-N-Out burgers from the drive-thru, it's NORMAL for Gavin Rossdale to buy vegetables from a farmers' market, and it's NORMAL for Jake Gyllenhaal to read a newspaper. 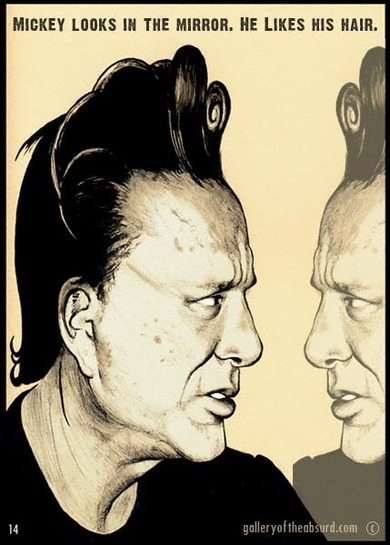 However, it is NOT NORMAL for Mickey Rourke to have a pompadour. They said Mickey was "sporting a greased-up pompadour 'do" along side a photo of his skyscraping swirling mass of hair. I hope Mickey stays NOT NORMAL because that's how I like him. No one else in Hollywood can pull off a pompadour the way he does. Medium: Ink on paper, photoshop.